If you were able to read the beginning of this post’s title without singing than you are missing out on something great! Doc McStuffins! My daughter will be three next month and during her three years of life we have watched A LOT of shows made for small children, and let me tell you, most of those shows made me want to rip my ears off of my head. That was until my daughter finally found Doc McStuffins. Really this show is very cute. The songs are catchy and the characters all have adorable personalities and what I liked the most was that my daughter now loves a show I can actually stand to watch for 30 minutes at a time! 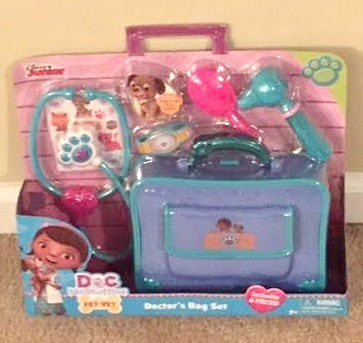 Well for this upcoming holiday season I knew that my daughter needed something under the tree that was from Doc McStuffins and I also knew I wanted it to be a doctor’s set. 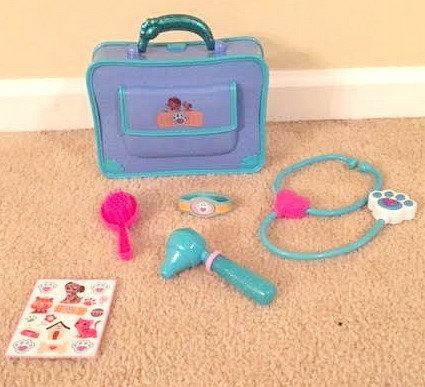 So I decided to get the Doc McStuffins Pet Vet Doctor’s Set from Just Play. 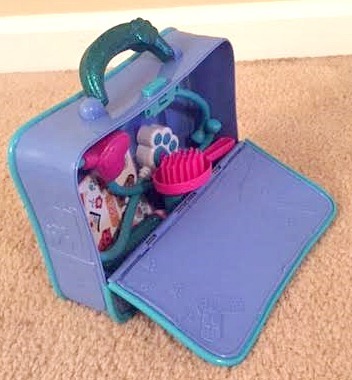 This Doc McStuffins Pet Vet Set retails for only $14.99 (What a great deal!). It is a great toy for young girls, and boys, who love to play pretend. The bag of course has a sparkly handle, if you know Doc McStuffins she loves sparkly accessories. All of the tools have bright colors and are sure to attract the imagination of any preschooler. I can just imagine how much fun my three year old daughter is going to have taking care of her “sick” stuffed animals with this great doctor’s set. The bag is not just for looks, it fits all of the supplies easily inside of it. The bag opens in the back with a small button and closes with very little effort. I know my daughter will have a lot of fun with this toy and it is great that it is something that is her size and will be easy for her to carry around the house and even out on errands. Let me know who in your life would love this as a gift for the upcoming holidays in the comments below or if they have any other Just Play product on their wishlist. My 4 yr old daughter would go nuts she loves everything Doc McStuffins! !